Our range of seats and harnesses for Motorsports are rigorously designed to meet the strict safety requirements of FIA safety regulations. Always check for the FIA safety hologram or make sure that a race seat complies with your local racing regulations. Our range of racing seats are designed for minimal weight and maximum safety to ensure the highest levels of on-track performance and durability. We’ve chosen harnesses from renowned suppliers to the professional racing industry. 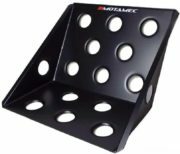 Browse our range of Cobra, Momo and Motamec race seats, found at the highest levels of competition in Motorsport.